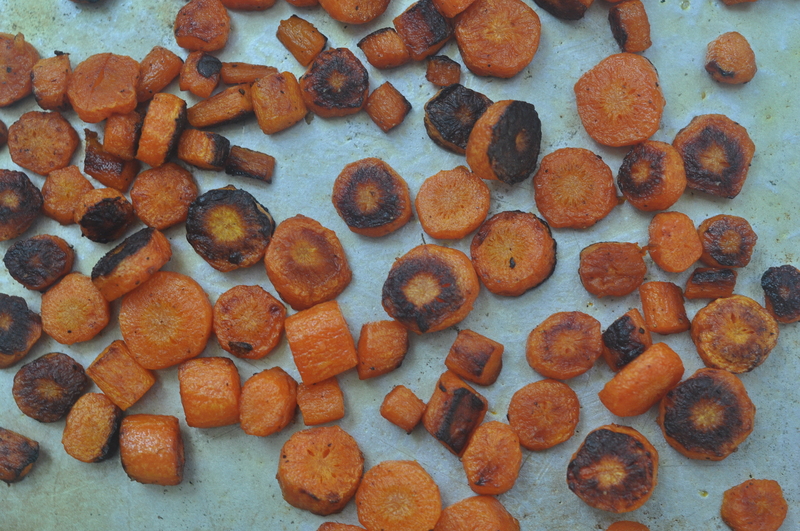 This roasted carrot soup won Food52‘s contest for Your Best Carrot Recipe, beating out 217 other entrants. It bested the predictable salads, slaws, and carrot cakes; not to mention some more surprising recipes such as Candied Carrot Balls and Carrot Cake Ice Cream. 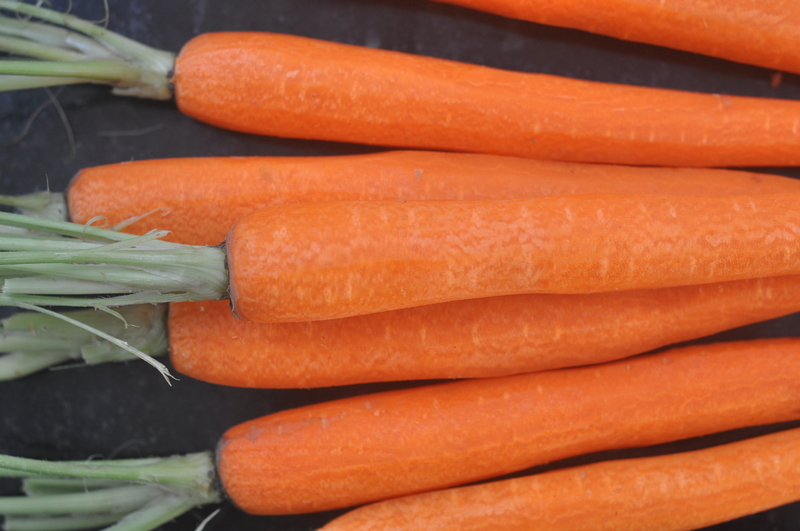 Perhaps more significantly, it topped more than twenty other carrot soups. It’s that tasty. Roasting the carrots intensifies their flavor (not to mention their sweetness) and the ginger and thyme, which steep in the broth before it is added to the carrots, bring a subtle complexity to the bowl. This is not a carrot ginger soup. It is a carrot soup with a slight kick. It is also ridiculously simple. 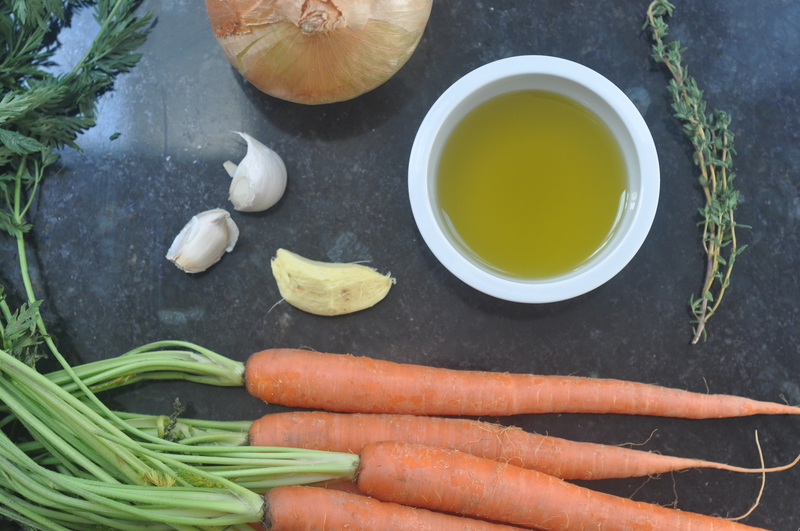 The recipe calls for just seven ingredients: carrots, olive oil, vegetable stock, a sprig of thyme, ginger, onion, and garlic. It isn’t a meal in a bowl, by any means. I served it with naan and some leftover pizza. The next time I make it, I’ll round out the meal in a less haphazard fashion, and when I do, we’ll hear the The Professor’s grade. I found the recipe for SpiceBoxTravels‘ Smokin’ Hot Vegan Vaquero Chili soon after the food-blogger posted it on Food52, and I couldn’t stop thinking about it. In part, I was fascinated by the beans themselves: no boring brown, the Vaquero is dappled in black and white, patterned like an Appaloosa horse. But the recipe also got me thinking: Given The Professor’s focus on taste, interestingness, and satisfaction, a good chili would be an easy A+, right? Mouth-tingling flavor? Check. Belly-filling beans? Check. And this recipe, with its surprise ingredient, seemed to check the interesting column too. I had to try it ASAP. 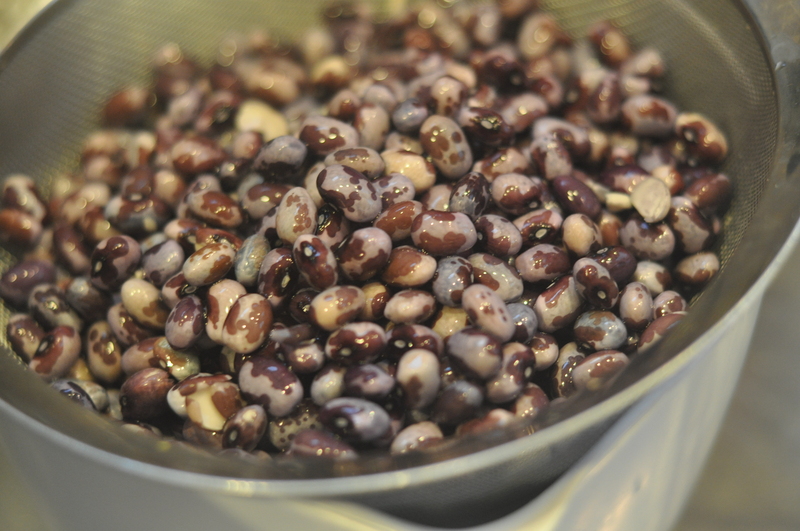 So I Googled myself to heirloom bean-grower Rancho Gordo‘s website to order some Vaquero beans, waited a week for UPS to deliver the beauties, and started them soaking. Then I diced and sauteed and boiled. And boiled some more. And a few minutes more. 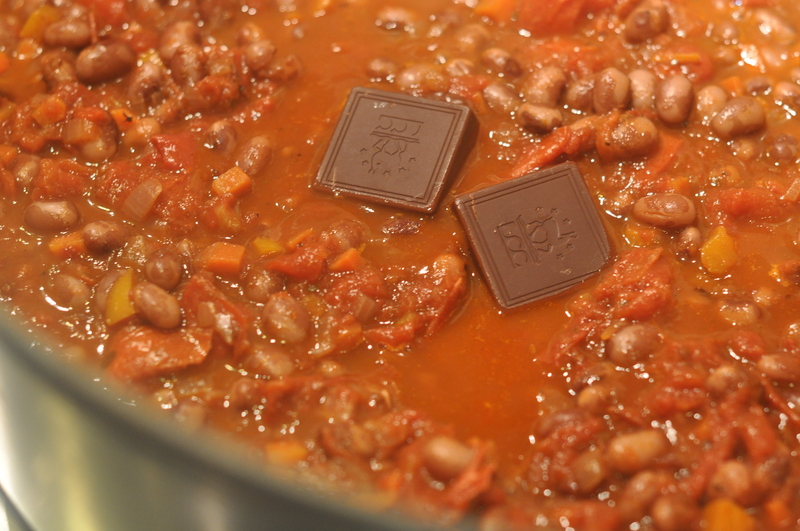 Finally the beans were done and I stirred in the surprise ingredient: dark chocolate. Food52’s tester had noted that “Adding the melting chocolate at the end more than compensated for the depth meat would have added, and rounded things out for a great balance of flavors.” The tester also mentioned that she had adjusted the spice, adding just one of the chipotles in adobo sauce that the recipe called for and only a pinch of cayenne. So with the kids in mind, I added just one chipotle and nixed the cayenne altogether. I also cut down on the chocolate — a little. And there my problems began. For the recipe to work, the sweetness needed to balance the smokin’ heat. Yet I hadn’t added much of the spice. So the result was too sweet for The Professor and me, and yet still too spicy for the kids. The Cook will try SpiceBoxTravels‘ Smokin’ Hot Vegan Vaquero Chili again in a few years, when her eaters are ready for more spice. In the meantime, any curious cooks out there should try this recipe. As The Professor said, “The chocolate makes the recipe very rich.” And when a meat-lover calls a vegan dish “rich,” that’s saying something. You can find the recipe here. Note: I had to cook the beans much longer than the recipe indicates. The kitchen wizards at Cook’s Illustrated wrote two paragraphs about “why the recipe works” but let me focus on five words: “ingredients that would boost flavor.” And indeed, the dish is bursting with flavor. Briny Kalamata olives. Garlic. 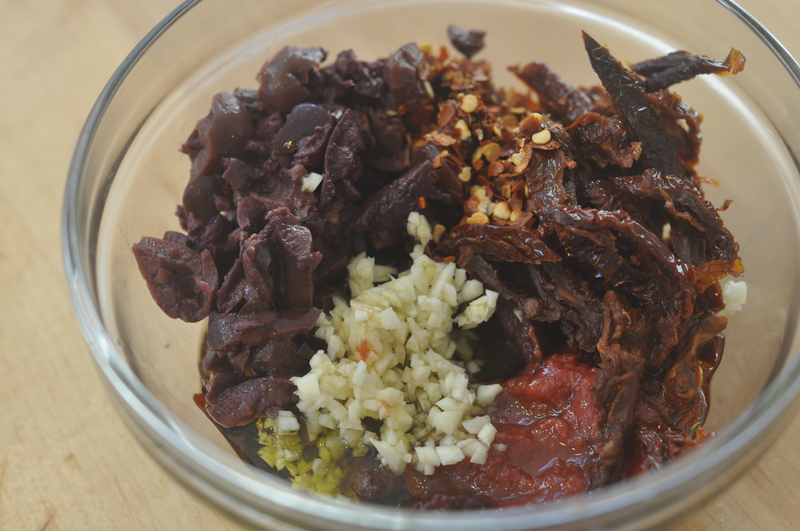 The kinda-sweet, kinda-savory intensity of sun-dried tomatoes in olive oil. Not to mention the punch of the basil, with a nice assist from some parsley, an under-rated herb as far as I’m concerned. But getting back to flavor, The Professor agreed with Cook’s Illustrated and gave the dish an A for taste. “It’s not as satisfying as, say, the lentil minestrone soup,” he added, though he gave it an A- in that category. I should mention that I tossed some kale — parboiled and sliced into crinkly ribbons — into the dish, adding both color and a bit more substance to the meal. I suspect that, without the kale, the dish would have ended up in the B-range for satisfaction. On interestingness, it scored a B+. “In an odd way, the stronger the flavors, the harder it is to maintain interest,” said The Professor, always on the lookout for a paradox. Though, in truth, it’s no paradox: A recipe that combines different, compatible flavors, giving an eater a slightly different combination of tastes with every bite, is always going to be more interesting than a dish whose ingredients meld into a single, dominant flavor. 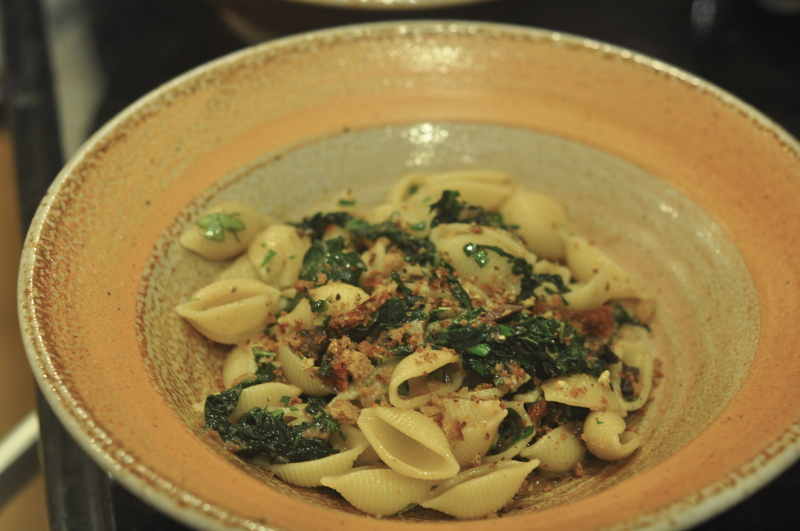 But at least the bread crumbs, sprinkled on top of the pasta as it is served, added an interesting crunch. In any case, an interesting dish isn’t necessarily a tasty one. And — if you like olives — you will love this easy pasta, which walked away with an A- grade overall. 1) Combine 3 tablespoons olive oil, 1 tablespoon garlic, tomato paste, red pepper flakes, sun-dried tomatoes, and olives in a medium bowl. 2) Put a pot of water on to boil. Add remaining salt and parboil the kale for 3-4 minutes. Cool, squeeze dry, and slice into thin ribbons. 3) Pulse bread in food processor until coarsely group, about 16 one-second pulses. 4) Heat remaining olive oil in a saute pan over medium heat until shimmering. Add the bread crumbs and stir until they begin to brown. Add the rest of the garlic, stirring regularly until the garlic is fragrant and the bread crumbs are golden brown. Transfer to plate and let cool.Wipe out the pan. 5) Return water to a boil and add the pasta. 6) While pasta is cooking, add the olive mixture to the pan. Cook until the mixture is rusty red, about 4-6 minutes. Add 3/4 cup water from the pasta pot to the olive mixture and simmer for two minutes. Add the kale and stir to coat. Then remove pan from heat. 7) When pasta is just shy of al dente, drain, reserving 1/2 cup of the cooking water. Add olive mixture to pasta and toss over medium heat until the pasta absorbs most of the liquid, about 2 minutes. Stir in 1/2 cup Parmesan and adjust consistency with reserved pasta water. 7) Remove pan from heat and stir in herbs. Adjust seasoning with pepper. Serve topped with remaining Parmesan cheese the bread crumbs. One afternoon last week I opened the fridge, looking for inspiration. I didn’t have a dinner plan and didn’t feel like going to the store. Moreover, having put a lot of effort into cooking a new recipe the night before, I wanted something quick and easy. I found a hunk of creamy blue cheese, left over from a dinner party, and some fresh spinach and thought, why not make a pasta? A Google search led me first to The Passionate Cook and her recipe for pasta with gorgonzola, spinach, walnuts and … single malt. I didn’t follow her recipe per se — The Professor is serious about his single malts and I didn’t think my four-something would appreciate the flavor in any case — but it convinced me that the idea wasn’t insanity. And I liked the idea of adding walnuts, both for their nutty flavor and for the crunch that they would add to what might otherwise be a rather soft, dare I say “mushy,” meal. One thing I’ve learned about cooking vegetarian meals for meat-lovers is that you can’t ignore texture. I also decided to top each bowlful of pasta with diced pear. The cool, crispness would, I thought, add yet another texture. And as for taste, blue cheese and pears are a classic combination. Bringing it all together was delightfully easy. 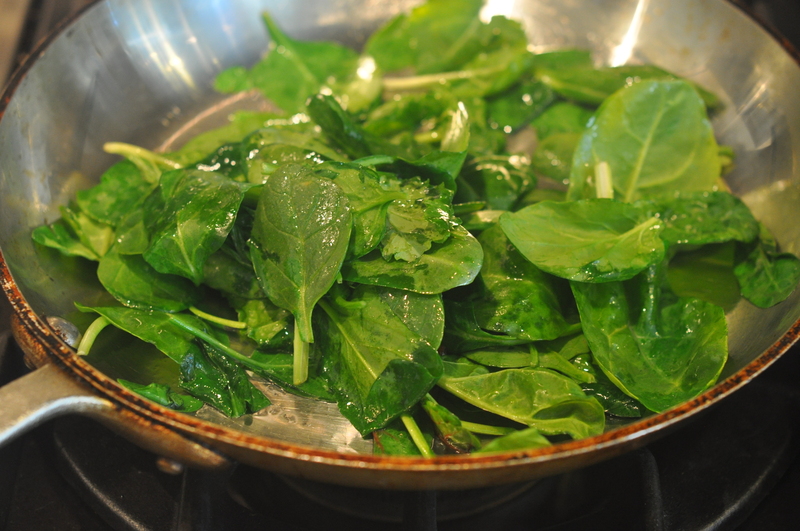 While the pasta was cooking, I wilted the spinach in a saute pan with a touch of olive oil and some salt. 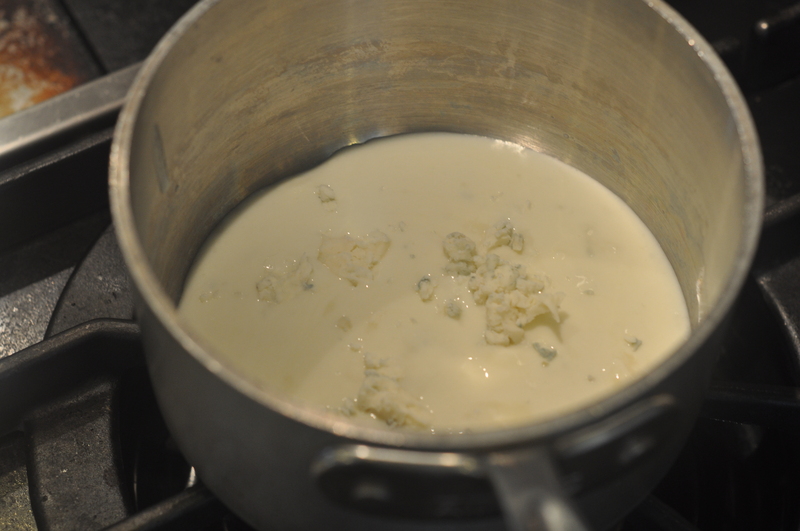 Meanwhile, I tossed the blue cheese into a saucepan with some milk, stirring it occasionally as it melted. 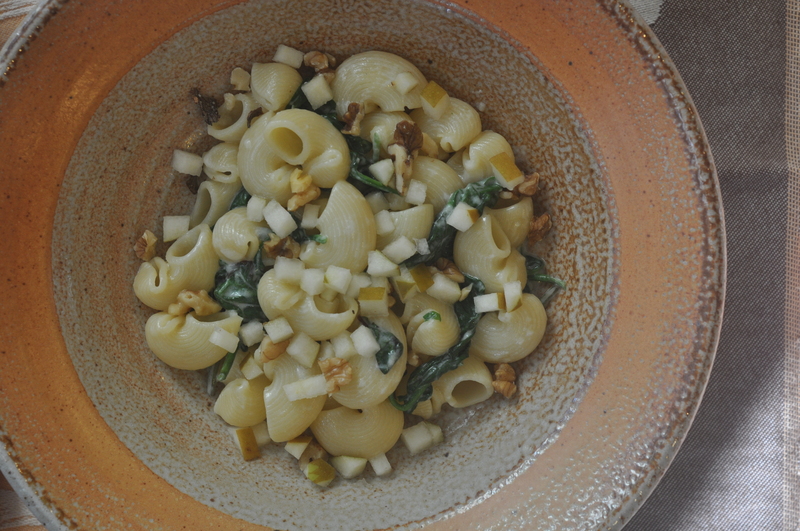 When it had, I poured it into the saute pan with the spinach, added the cooked pasta, mixed and served, topping each bowl with chopped walnuts and crisp cubes of pear. The Professor, in his reserved way, was enthusiastic. Though he suggested trying the dish again with Gorgonzola, a sharper blue than the one I had used. The Cambozola, a sort of “blue brie,” was a tad too creamy and subtle (if you can use the word “subtle” to describe a blue cheese). Even better, my picky four-something ate it. Or most of it — she picked around the spinach but gobbled up enough of the unused diced pear to make it a vitamin-rich meal. 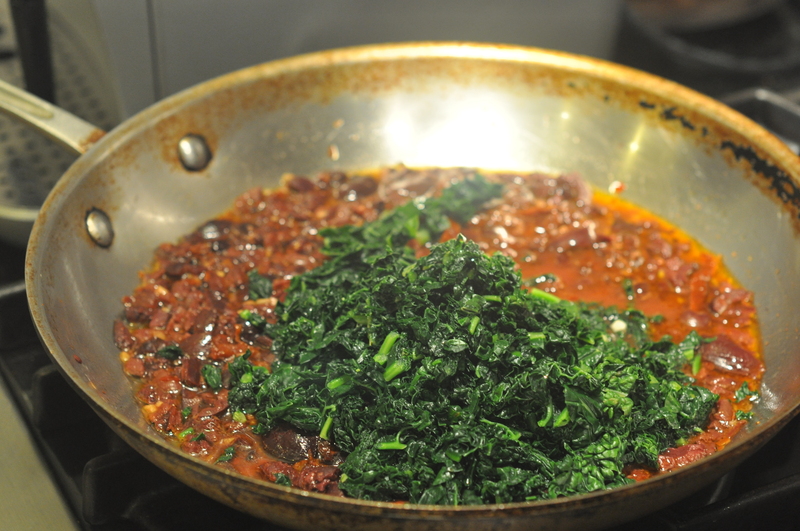 3) Toss spinach and a tsp of olive oil and a pinch of salt in a large saute pan over low heat. 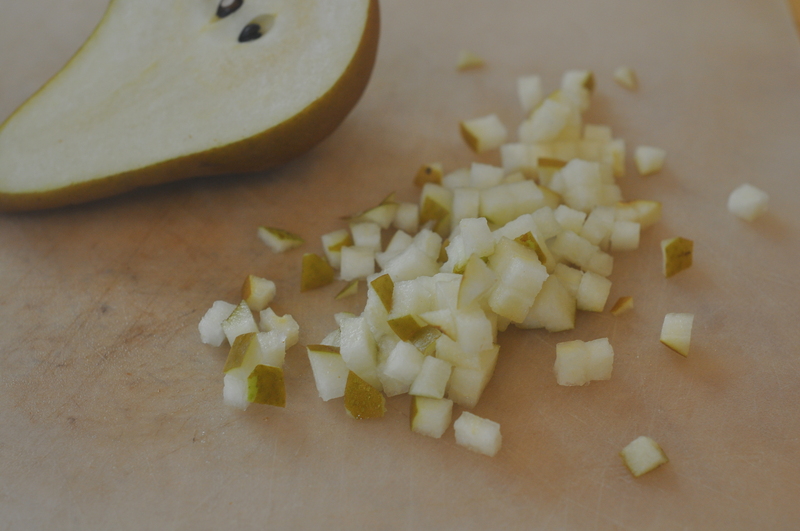 4) If you haven’t already diced the pear and chopped the walnuts then you could do that now. 7) Add the cooked and drained pasta to the saute pan when it is ready. Winter is soup season. OK – every season is soup season. But still, even if you aren’t trudging through snow to get home, a warming soup is a the best welcome home on a cold day. And I’ve cooked a lot of soups this winter: Deborah Madison’s lentil minestrone; Martha Rose Shulman’s pureed butternut squash and white bean soup (more on that soon); Mark Bittman’s sweet potato chowder (ditto); Yotam Ottolenghi’s Savoy cabbage and Parmesan rind soup (ehh …); and an utterly forgettable parsnip soup. Some have done well by The Professor; others not so much. But here’s what I’ve learned: in most cases, the stock more than matters – it’s the deciding factor in whether a vegetarian soup is truly satisfying to a meat-eater. So what is the best vegetarian stock? One year ago, I spent the better part of a day gathering, peeling and chopping ingredients (17 in total, including collard greens and lemon grass) to make Cooks Illustrated‘s Ultimate Vegetable Stock. 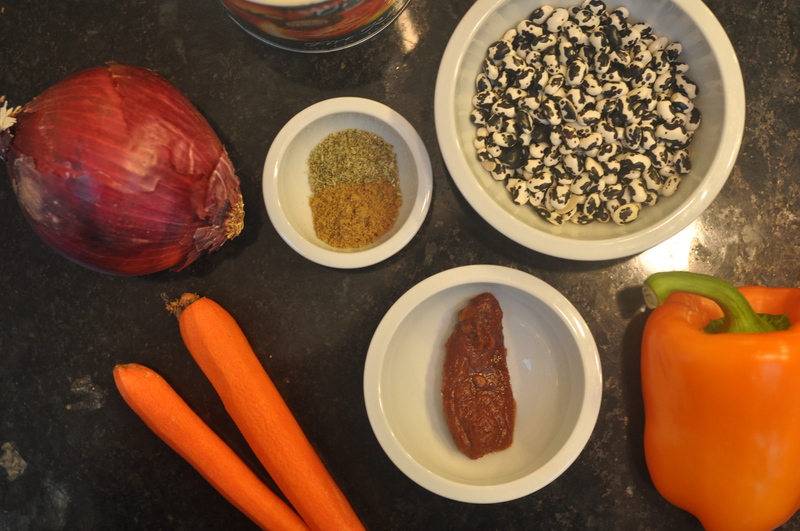 The recipe’s creators were aiming for “a nicely balanced, robust vegetable stock recipe that vegetarians and non-vegetarians alike would consider making.” And the stock was certainly more complex and flavorful than any packaged option.Though 5 hours and 17 ingredients better? I’m not so sure. Since then, I’ve been using a stock based on Superior Touch’s Better Than Bouillon, embellished with a few teaspoons of soy sauce. In general, The Professor has been happy with the flavor that it adds, but I keep wondering if there is a simple home-made alternative. 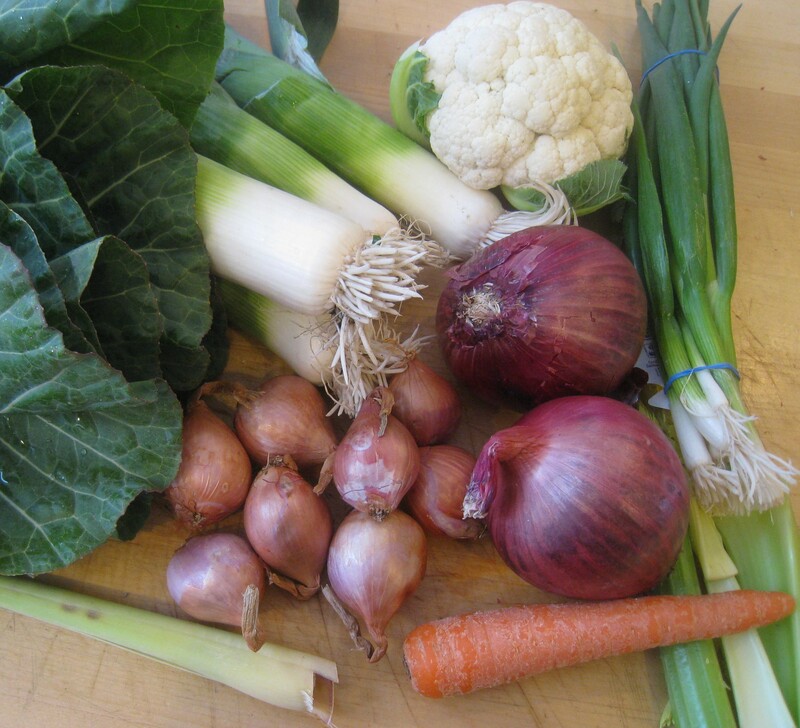 If you have a great recipe for home-made vegetable stock, send it to me and I’ll include it in my vegetable stock taste test. After cooking Deborah Madison’s delicious lentil minestrone soup yet again last week, I decided to go back through her best-selling Vegetarian Cooking for Everyone in search of other recipes. I cracked open the book one morning and 609 pages later, I had several ear-marked pages and my menu for the night: Lentils with Wine-Glazed Vegetables with a Pastry Crust and a side of Catalan-Style Greens. And yes — you would be right to think that after 609 pages I might have found a recipe that didn’t involve nine of the same ingredients I’d diced, minced and tossed into the lentil minestrone. Spicy stir-fried tofu with coconut rice, anyone? Wild rice with walnut and scallions saute? But you see, I am still trying to earn ten A’s and I knew lentils had typically done well by The Professor. Plus, it gave me a chance to use my ramekins, which would otherwise sit in the basement until blueberry season. The recipe is straightforward and you can cook the lentils and vegetables ahead of time and let the flavors blend, which only makes the dish tastier. I did make a few adjustments to the recipe: I used black Belugas, which, like the French green lentils the recipe called for, hold their shape better than regular brown lentils. I added a several sprigs of parsley and thyme to the lentils, tying the herbs up with the bay leaf in a bouquet garni. I mixed a tablespoon of vegetable bouillon into the lentil’s cooking water. And, because I am genetically incapable of using just one clove of garlic in any dish that calls for it, I added two. When I returned to the kitchen at 6:00, I spooned the lentils into the ramekins, topped each with puff pastry, and put them in the oven. While they baked I sauteed the spinach. “So we’re having an experiment for dinner?” The Professor asked, as he entered the kitchen. “Yes — it’s lentils and vegetables topped with puff pastry,” I told him. In any case, next time I make a “lentil pot pie” I’ll add more stock, which I think will push both taste and satisfaction grades into the A range. And I’lll try a different side — The Professor, to my surprise, didn’t like the Catalan-Style Greens, aka spinach sauteed with pine nuts and golden raisins. Which left him hungry after eating one ramekin clean but not hungry enough to dig into a second. Instead he ate the remaining lentils with wine-glazed carrots out of the pot. 1. 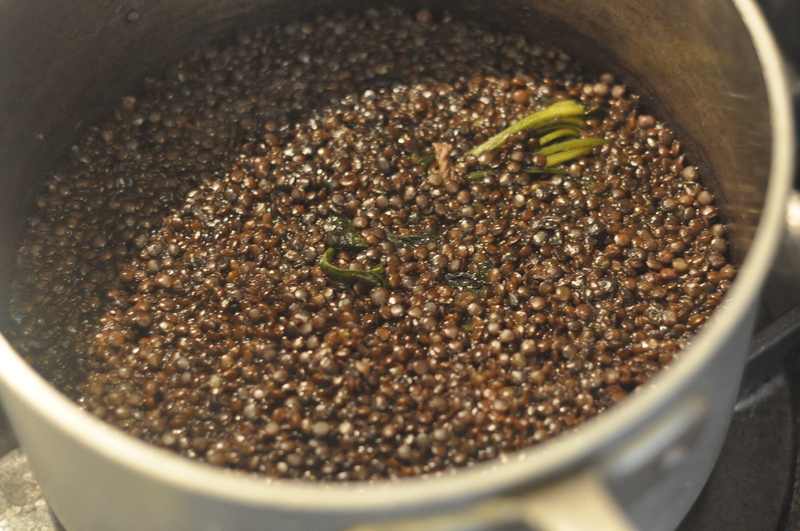 Put the lentils in a saucepan with 3 cups water, vegetable bouillon (if using), 1 teaspoon salt, and the bouquet garni. Bring to a boil and then let simmer until the lentils are tender, about 25 minutes. 2. Heat the oil in a medium skillet. Add the onion, carrot, celery, and 1/2 teaspoon salt, and saute over medium-high heat, stirring frequently until the vegetables are browned — about 10 minutes. 3. Add the garlic and tomato paste and cook for 1 more minute. 4. Add the wine, bring to a boil and then lower heat and simmer, covered, until the liquid is syrupy and the vegetables tender — about 10 minutes. 5. Heat the oven to 375 degrees. 6. 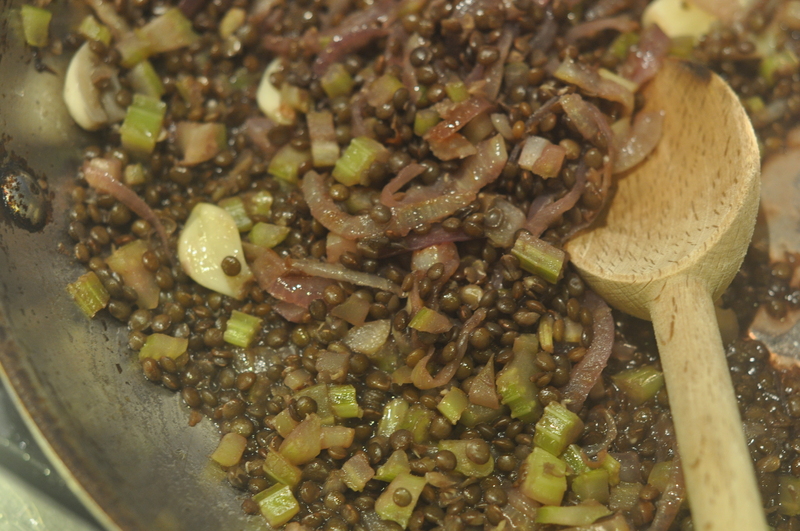 Stir in the mustard and add the cooked lentils, along with their broth. 7. 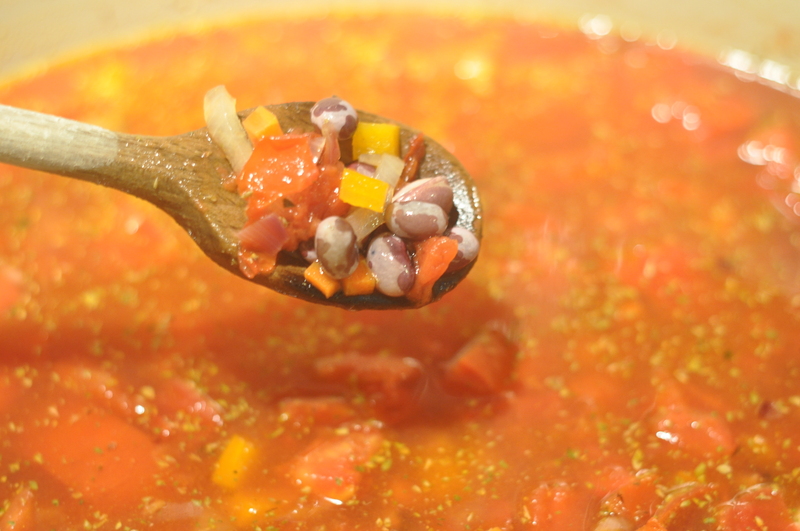 If the mixture is too soupy, simmer until the stock is reduced. 8. Stir in the butter or olive oil and season with pepper. 9. Spoon the lentil mixture into four ramekins. 10. Roll out the puff pastry to 1/8 inch thick and cut out four pieces, each just a little bit bigger than the ramekin. 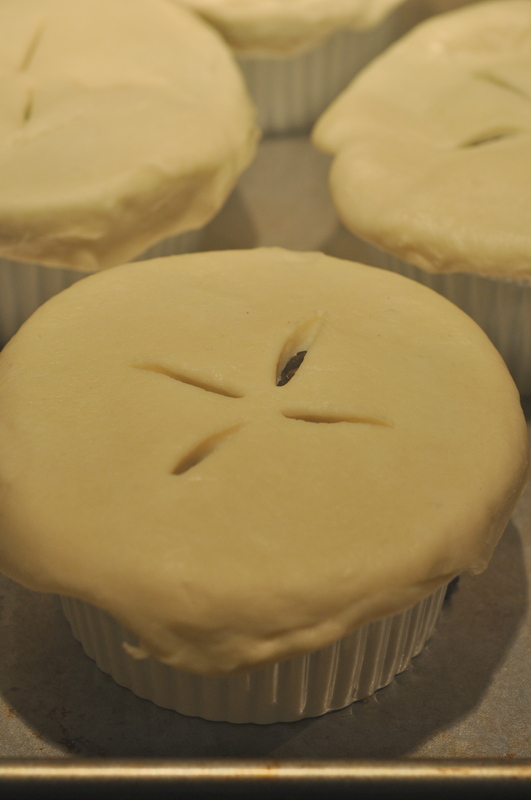 Make a few small cuts (for the steam to escape) in each and put them on top of the ramekins. 11. Bake until the pastry is puffed and golden, about 25 minutes. The River Cafe comes to my rescue! The short days and downright cold nights of the last week reminded me that autumn in New England is really two seasons: it begins as the glorious end of summer, with blue skies, brilliantly colored leaves, and warm temperatures; and ends as the beginning of winter, with dark, gray afternoons. 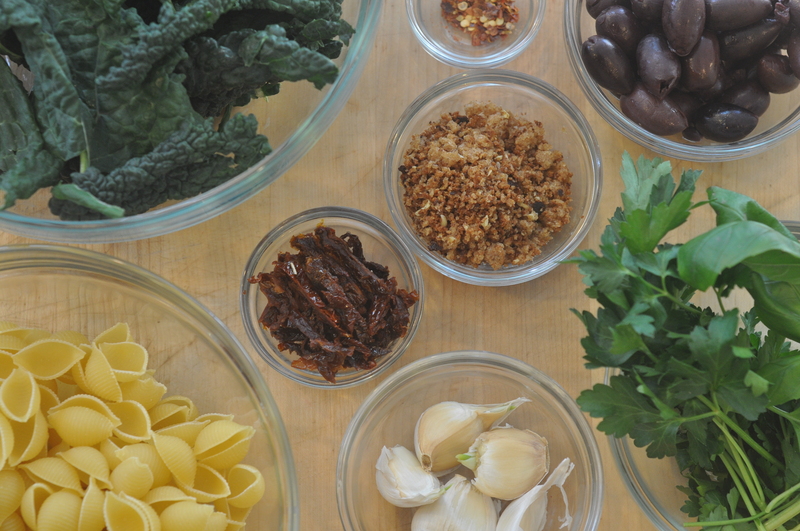 Afternoons that make me long for a warming dinner like this pasta with kale and lentils. 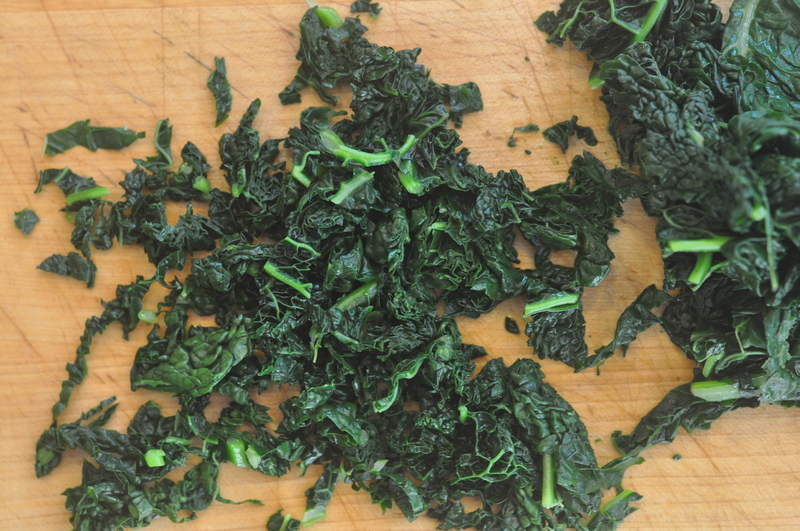 Cavolo nero, as my “Italian” mother would call it, is a green with many names. It is also called Tuscan kale and lacinato kale, or dinosaur or black kale. And while I love this kale variety, you could use most any dark leafy green. When I cooked the dish last night, I used baby red Russian kale, because that’s what had arrived in our weekly CSA box, and, natch, I nixed the pancetta. 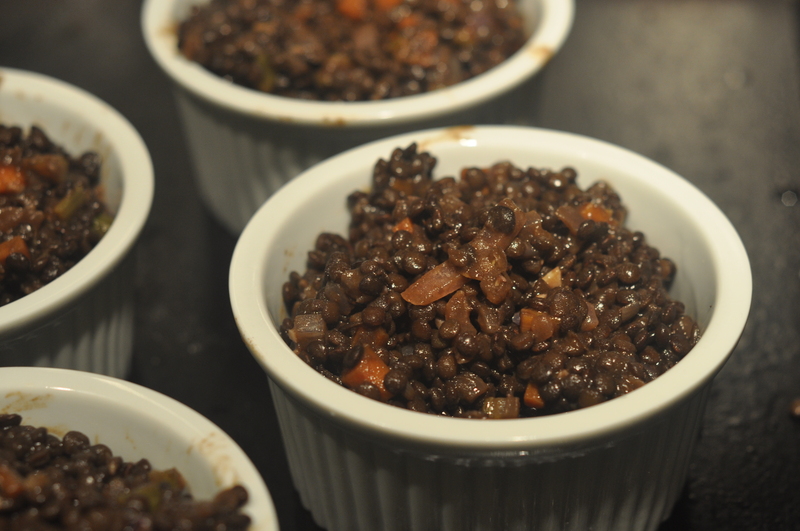 I also used black beluga lentils rather than the Castelluccio or Puy lentils that the recipe called for. All are members of the prized family of small lentils that tend to hold their shape through cooking. And …. drum roll … The Professor gave the dish an A-!!! In terms of taste, The Professor liked the combination of flavors. The garlic and onions did some of the heavy lifting, he thought, but the lentils helped too, adding a “not quite meaty” taste. I’m sure you’ll hear about this dish again as I try to improve its grade from A- to A+. But in the meantime, happy Thanksgiving. 1. Heat the oil in a heavy-bottomed pot and the stock in a small saucepan. 2. 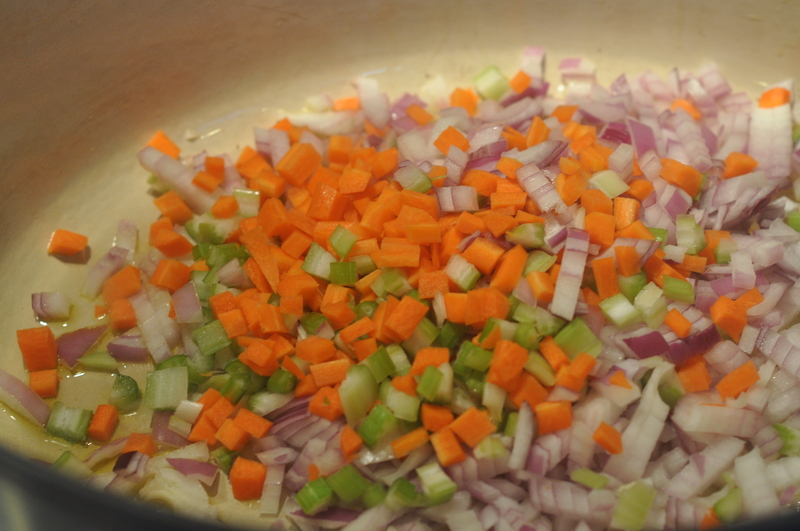 Add the onion and celery and cook until they begin to color. Add the garlic and cook for five minutes. 3. Add the wine and cook briefly until it is reduced. 4. Add the lentils, stir, and cook to combine for 3-4 minutes. 5. Add the cavolo nero and enough stock to liquefy the mixture. Season with salt and pepper and heat through. 6. 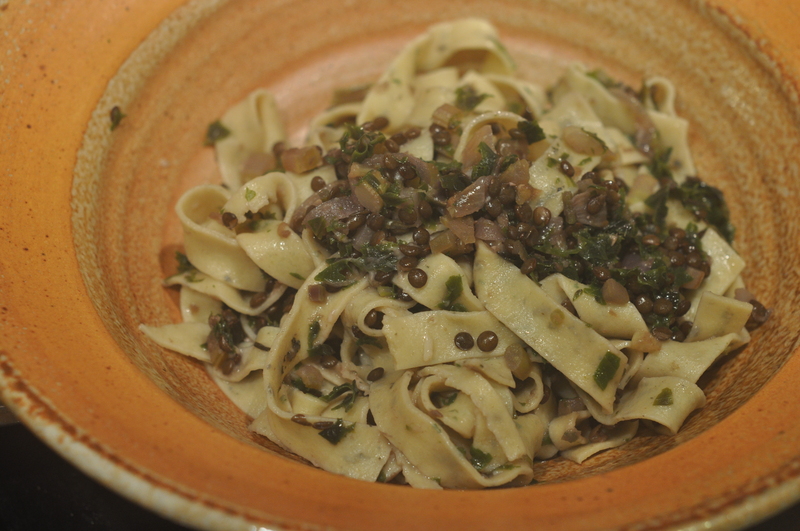 Cook the pappardelle, drain well, and add to the lentil mixture along with the parmesan. NOTE: Rogers and Gray boil their lentils in water for 35 minutes, with a celery stick for company. I’ve come to like Cook’s Illustrated’s approach, developed to produce lentils that maintain their shape and “firm-tender bite”: The most important step in making a lentil salad is perfecting the cooking of the lentils so they maintain their shape and firm-tender bite. There turns out to be two key steps. The first is to brine the lentils in warm salt water. With brining, the lentil’s skin softens, which leads to fewer blowouts. 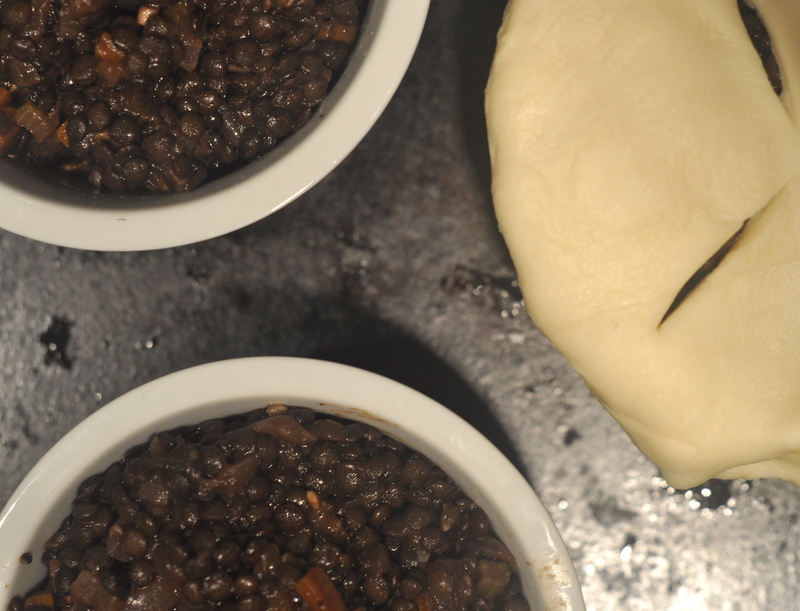 The second step is to cook the lentils in the oven, which heats them gently and uniformly. AND ANOTHER NOTE: I’ve just realized that I never wrote a post about Cook’s Illustrated‘s Lentil Salad with Carrots and Cilantro! I must have made it during my blog sabbatical. More on that soon! 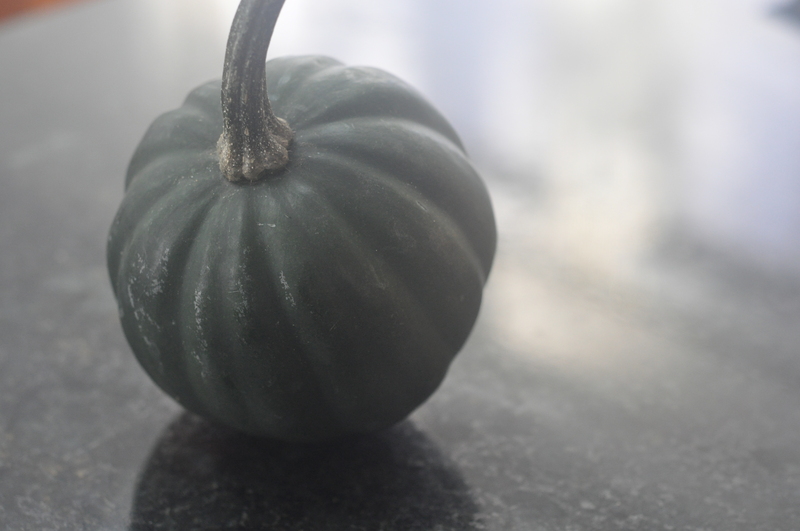 Thanks to our CSA box, we are awash in squash. I was considering trying Smitten Kitchen’s acorn squash with chili-lime vinaigrette. Have any of you tried it? Do you have any other fabulous squash recipes up your sleeve? Brilliant how-to video from the folks at Saveur! 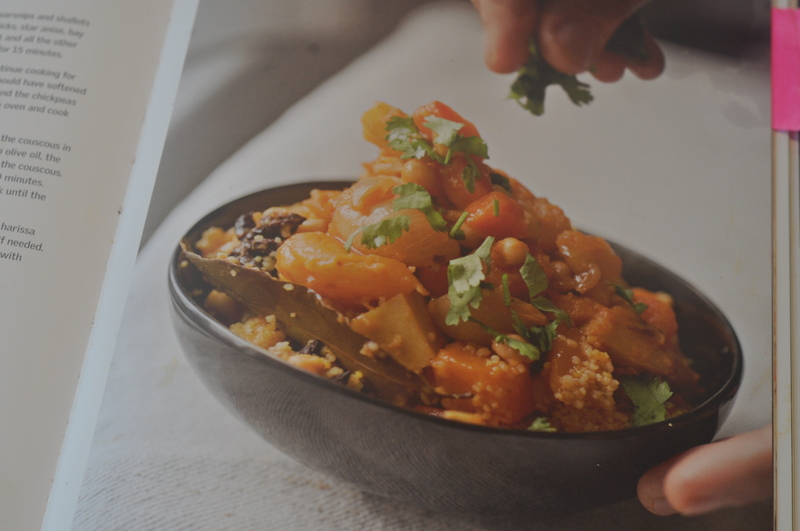 Yotam Ottolenghi, introducing his recipe for “The ultimate winter couscous” in Plenty, wrote that when he first published the recipe in his Guardian column, a reader complained about the long list of ingredients. And indeed, the list is long: from apricots to vegetable stock, the recipe calls for 23 ingredients. Did it matter? Not too much: The Professor liked the dish, giving it a B+/A-. Although when he heard about the missing apricot, he was curious, so I will include it next time. And based on The Professors comments, I think it could improve the dish on each of the three grading dimensions. For taste, he gave it an A- and said that it was “good, but a little bit one-dimensional.” For both satisfaction and interestingness, he gave it a B+, and suggested adding a side of sauteed greens to make the meal more satisfying. While I’m glad that he didn’t suggest a side of sausage, I wonder if the sweetness of the dried apricot might have deepened the flavor of the dish, satisfied the corner of our brain that loves sweet things, and made the dish more interesting. A second confession: I’ve made the dish twice, and both times, i replaced the couscous with a small round pasta that is often called Israeli couscous. The second time, I didn’t have enough Israeli couscous so I added some quinoa.The Professor isn’t exactly a fan of health grains, so I didn’t tell him before the fact. But after the eating was done and I’d come clean, he said that the quinoa added to both the taste and texture of the dish. Confessions done, next time I make Ottolenghi’s ultimate winter couscous, I’ll include the dried apricot. And maybe even the preserved lemon.